When wandering around Rome, you will occasionally come across little miracoli (miracles). Some happen, well, by happenstance, while others are well thought out. Many appear to be mysteries, with no one really knowing how they came about. One of the more interesting miracoli is also one of the smallest, the Aventine Keyhole. High above Rome, on the top of Aventine Hill, a surprise view waits for your eye and camera. If you come early enough, or perhaps late enough, you’ll pretty much be alone, but some tourists have caught on to this magical view and you might find a line leading out into the street in front of locked doors. 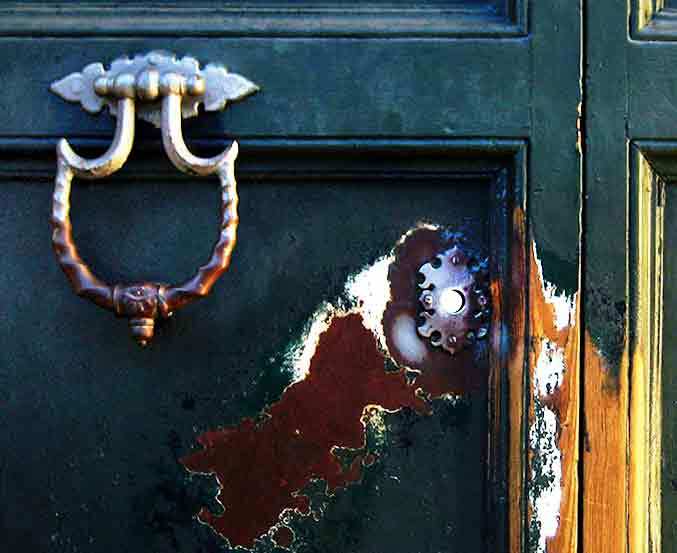 Then as you get closer, you’ll discover how thousands of people peering through this keyhole have worn away the paint right down to the bare wood, and the metal of the keyhole itself is worn and polished from thousands of peering eyes and pressing camera lenses. Still, this view is a treat, albeit a bit touristy, just as la Bocca della Verità is worth standing in line to take a picture of you with your hand shoved in it’s mouth, or how you’ll be compelled to “hold up” the Leaning Tower of Pisa while a companion snaps your picture. Priory of the Knights of Malta offers the most popular and picturesque view of Saint Peter’s dome. 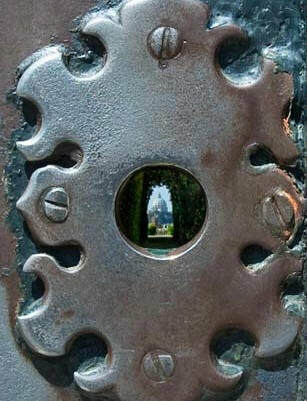 Looking at it through the ornate keyhole gives a magical view–an alignment, really–of St. Peter’s dome framed by hedges of the gardens of the Priory. The property was constructed in the Piazza Cavalieri di Malta, by Giovan Battista Piranesi in 1765. The Aventine Hill, according to legend, represents a sacred ship setting course toward heaven. There are many nautical elements in the design. For example, the ornamental door is the entrance to this ship’s deck, the manicured gardens and trees represented the rigging of the ship. The property lies in the piazza Cavalieri di Malta, designed by Giovan Battista Piranesi in 1765. According to Roman legend, Aventine Hill was imagined as a sacred ship that would eventually set sail for the heavens, so Piranesi incorporated many nautical elements and symbols into his designs. The ornamental door symbolized the entrance to the ship deck while the manicured gardens within were the ropes and riggings of the ship. Although the position of the door itself and the hedges obviously align with a view of St. Peter’s Basilica, the view through the keyhole–although indeed heavenly–was more than likely mere happenstance. Still, some historians claim that Pirasesi purposely aligned the view through the keyhole (curiously, it isn’t keyhole shaped at all, but round) to act as a long lens of a sea captain’s telescope, foreshortening the view of the dome of St. Peters to look as if it was right at the end of the allée of trees and not miles away, as it really is. Perhaps implying that the Voyage to heaven isn’t as long as one would think? 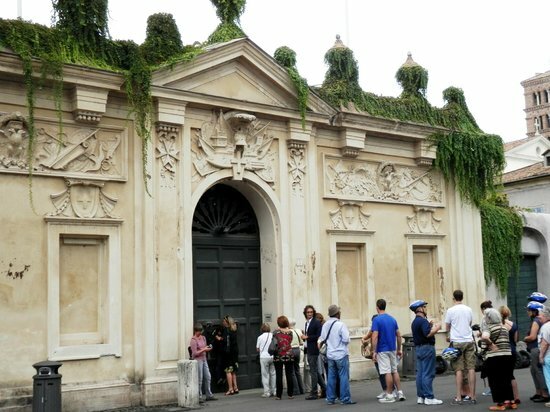 While up on the Aventine Hill, pay a visit to the Giardino degli Aranci (Orange Gardens). There you’ll find a wonderful park with more amazing views of Rome. 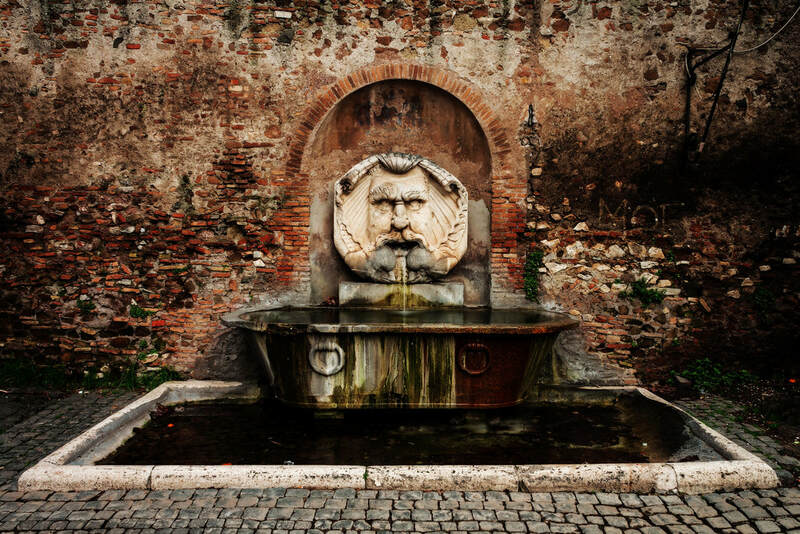 Before you enter the gardens, look for a beautiful mask fountain to the left of the gate. From the Ponte Palatino on the Tiber River, walk up the Via della Greca, then turn right and continue up the Clivio dei Publicii. You can visit the rose gardens of Roseto di Roma Capitale on the left. A bit farther on, bear right onto Via di Santa Sabina, to a small park on the right filled with orange trees, the Giardino degli Aranci. Enjoy the views of Rome. The Church of Santa Savina (next to the park) dates back to 450 A.D. Continue farther along the road to the Piazza Dei Cavalieri di Malta–on the righthand side you will see an old green door with paint that is peeling off. 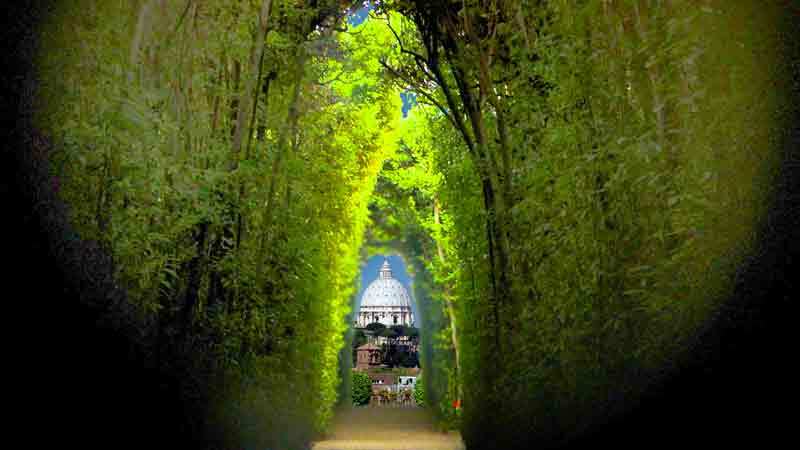 If you look through its keyhole, you will see a beautiful tree-lined path and at the end of the path is a framed view of St, Peters Basilica. Plan your visit on a clear, sunny day with blue sky for the best view.